Rollicking Retcons! It's the first part of our big, gallumphin', Stephen Moffat retrospective. The good, the bad, and the Silence. Clay, Christine, Andy, and new guy Dustin Hausner had a lot of fun with this one - so much fun, we had to split it in two. @coalhillcon podcast@coalhill.com Music: Lots of things from the soundtrack, and "Only In Dreams" by Weezer at the end. Ep 86 - Four To Doomsday II: Doom Harder! Happy Coal Hill-oween, everyone! We're back. Unfortunately, our plans for a "Coal Hill-O-Ween Spooktacular" were scuppered when we learned that our special guest star - Bela Lugosi - was dead, and had been for quite some time. So instead, we decided to discuss the announcement of the Doctor's latest companions, and catch you up with some nifty things we've been doing lately, such as: actually publishing a book (It's called WHY I GEEK, and it's full of essays about fandom, and you should buy it), and the awesome time we had at Time Eddy III in Wichita, KS, and the awesome time we're going to have at LI Who in Long Island, NY. We also chatted with David (from Greyscale Productions) about his incredible, home made, First Doctor console - with the Radiation meter and everything. If you love us, you'll buy our book: https://goo.gl/uqkBoC If you love us more, you'll follow us on Twitter: @CoalHillCon And if you really love us, you'll email us pictures of yourself in a homemade K-9 costume*. podcast@coalhill.com *-pictures are optional, but feel free to say hi. Fish heads. Fish heads. Roly poly fish heads. Fish heads. Fish heads. Eat them up, yum. This week, you get a parody of a Disney tune you might know from somewhere, Stephen extolling the virtues of candy cigarettes, and - oh, yes - Clay and Andy discussing the infamously terrible Patrick Troughton story that blew up Atlantis again for the first time, "The Underwater Menace." EXCEPT... is it really that bad? Can even Clay find something to like in this, the most maligned of all maritime melodramas? Find out... on the Coal Hill AV Club! Twitter: @coalhillcon email: podcast@coalhill.com music: coupla cuts from Daniel Olsen's soundtrack for the iOS game DEVICE 6 https://danielolsen.bandcamp.com/album/device-6-original-soundtrack Guttermouth - "I'm Destroying The World" Barnes and Barnes - "Fish Heads"
Ep 78 - Lucky 13! The smoke has risen over the BBC, announcing the ascension of a new Doctor - and it's Jodie Whittaker! Needless to say, we're pretty darn excited about the prospect of the first female Doctor - and we've got a packed house of Coal Hill regulars, calling in from such far flung locations as "the deep dark woods of North Carolina" (Clay) and "a car driving through Queens from Coney Island" (Christine) Andy, Stephen, and Emma are also on hand. (We apologize for the patchy audio - like I said, this was mostly done on phones and kind of at the last minute, but we wanted to get this one out while the 'squee' was still fresh.) Music: "Kashmir" as covered by Lez Zeppelin, and - yes - our brand new rendition of the Coal Hill AV club theme. Comments/etc. 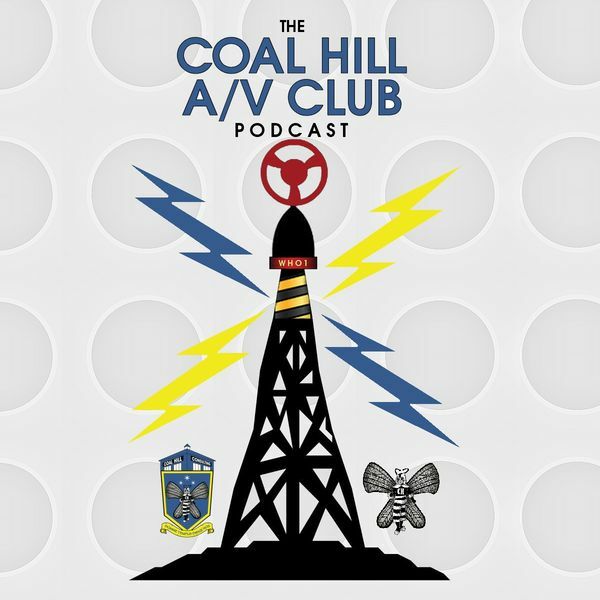 : podcast@coalhill.com Twitter: @coalhillcon or @geeklectic Join the Coal Hill AV Club Facebook group for more into... OH! And don't forget to vote in our End of Series 10 awards poll: the 2017 Jarvies at coalhill.com/thejarvies. Meddlin' Mondasians! It's the second half of our epic exploration of the origin of the Moffassian Cybermen. Amanda Rae talks tropes and Cyberbills, our robotic announcer DELIA continues hatching her evil plans, we talk about "That Scene, You Know, The One About Gender," experience some pretty deep feels, and both good tea, and bad tea. Plus, Emma drops by, and Andy loses a lot of friends, probably. Oh, and our ongoing Les Mis parody looks to the "Stars." Song of the week: Caspian - "Hymn For The Greatest Generation"
Bleepin' Black Holes! It's the first half of our two-part discussion of the first half of Peter Capaldi's epic three-part swansong*. And if that's not confusing enough for you, just wait until we find out that our robotic announcer has gone rogue once again! Meanwhile, Clay, Stephen, Christine, and Andy discuss sonic parasols, Mondas, the death of companions, Capaldi's epic hair, and so forth. Also there's a Kids Talk Who segment. And, if that weren't enough... later this very week, you get the second half of the episode, which features a few more people, a discussion about feminism in the Moffat era, and at least 10 minutes of Andy sitting alone in a room and gushing about how completely awesome the Mondasian Cybermen are. Because I KNOW RIGHT? (This week's song: "Kemosabe" by Everything Everything.) *-If you include the Christmas special.